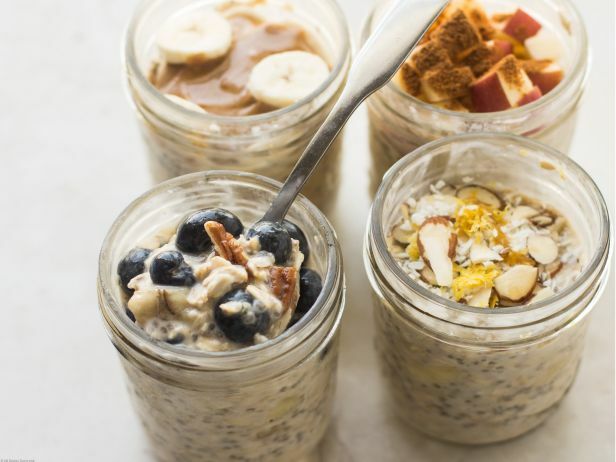 Overnight Oatmeal - Ready When You Rise! I really don't enjoy making breakfast first thing in the morning. All I need when I arise is a half a pot of coffee. Then awhile later a piece of hot toast with peanut butter is usually as deluxe as it gets. I think that's why I enjoy going out for a wonderful hot breakfast so much. It's my favourite restaurant meal. Not only do they keep filling my cup, they offer me all the wonderful breakfast foods I'm too lazy to make at home - omelets, classic eggs and bacon and breakfast bowls. I have, however, been exploring some make ahead options as my diet need improving. First is a Vanilla Chia Seed Pudding (recipe HERE) that I chock full of fruit. It doesn't take long to mix up and is good in the refrigerator for several days. Another great option that takes a little more work is the BC Cranberry and Chocolate Power Cookies (recipe HERE) created by a local chef. They are gluten and dairy free, full of fiber and tasty as well. For a hot option I began to consider overnight oatmeal. There are a couple ways to do it - one with a thermos and the other in the refrigerator. I have 2 links for the thermos variety. First is the tradition with steel cut oats (not rolled). 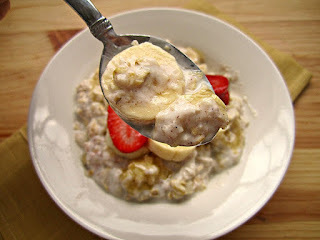 I enoyed this at my brother's house - http://www.thermoscooking.com/steel-cut-oatmeal-recipe/. You just scoop it out in the morning and add your toppings at the table. I also found another thermos recipe that uses rolled oats and suggests you can add dried fruit and cinnamon when you mix it up the night before - http://www.chowhound.com/post/overnight-oatmeal-thermos-679150. I am going to have to try this soon. Steel Cut Oats cooked overnight in a thermos. The one I decided to try last night is inspired by Scandinavian Muesli. Here you combine rolled oats, milk or non-dairy option (rice milk, almond milk, etc.) and Greek yogurt. You mix it up the night before and eat it cold or heated in the microwave the next morning. Additions can be added the night before or in the morning for extra crunch. There are lots recipes you can try, but here is the combination I came up with. I chose to eat it hot more like cooked oatmeal. The yogurt added a tart note and it honestly didn't need any sweetener. Don't forget - if you want the final product to be firmer or runnier, just adjust the rolled oats to milk/yogurt ratio. AND if this calls to you - you really should check out the great variety of options offered in this Food Network article HERE. Really fun and lots of choice. Enough for 4 days unless you eat big servings. 1 Ripe Banana, thoroughly mashed. Mix rolled oats, milk, Greek yogurt, banana and chia seeds thoroughly. Gently stir in nuts and berries. Seal tightly in Tupperware container and refrigerate overnight. In the morning, place your desired serving amount in a bowl and warm in the microwave or eat cold like a traditional Muesli. Option - fruit and nuts can be added in the morning instead of the night before, but I like it ready to go when I get up.